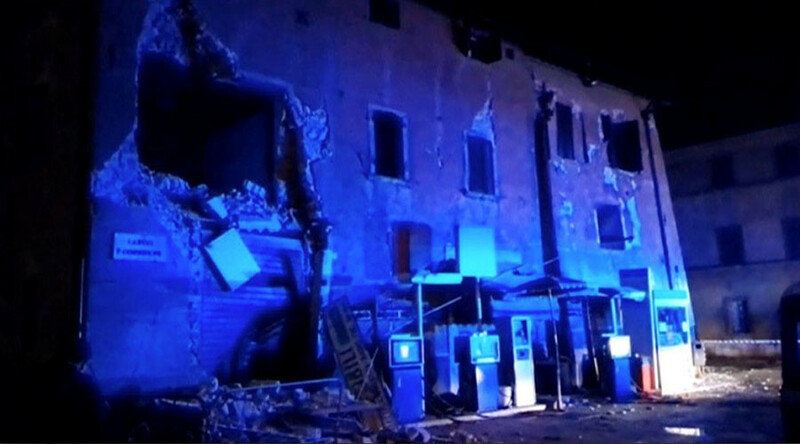 A 6.0 magnitude earthquake hit the Marche region in central Italy, just hours after a 5.4-magnitude tremor damaged buildings and cut power lines across the area. Buildings in the region have been damaged, but there have been no reports of fatalities. However, several thousand people have been left homeless as of Thursday afternoon, according to the Civil Protection Department. A series of powerful aftershocks between magnitude 4 and 4.9 struck the area about five hours after the first tremor. The strongest earthquake occurred 9.18 p.m. on Wednesday, 71 km (44 miles) east of Perugia. The United States Geological Survey reported it as a 6.0 magnitude temblor, while Italy’s National Institute of Geophysics and Volcanology said it was a 5.9. Trains were stopped for checks, while police closed off some roads in danger of potential landslides. A football match was briefly suspended. Impact was felt as far away as Naples, Rome and Florence. In the capital, historical monuments were shaking from the shockwaves. Prime Minister Matteo Renzi has returned from a trip inside the country to chair an emergency meeting in Rome, and has canceled a planned TV appearance. The first earthquake was detected at 7:11pm local time, about 66km to the southeast of Perugia, striking a mountainous part of the Marche region and lasting several seconds.The exact epicenter of the tremblor remains unclear, but it was relatively shallow, at about 9km below ground. Within an hour of the first earthquake, there was a series of small but noticeable aftershocks, ranging in magnitude from 2.5 to 2.8. After the second there were at least four after shocks exceeding 3 on the Richter scale. The official said that the emergency is exacerbated by a downpour, and intermittent problems with mobile phone communication. Police say that the town is in "crisis" and have dispatched rescue teams, Castelsantangelo sul Nera. A video posted by a Huffington Post journalist shows rubble strewn through the streets of Visso, a commune less than 10 km from the epicenter. The Civil Protection Agency, which has been overseeing the response, says that so far only two injuries have been identified, in Visso. The first, smaller earthquake, may have served as a warning, as people were in open areas, and prepared, when the second temblor struck. Schools will be shut in some cities throughout eastern and central Italy on Thursday, and in Ascoli, local media is reporting that hundreds of people are gathering in public squares, and sleeping outside in cars. The earthquakes are in the same area of seismic instability in the Apennines as the one that struck the village of Amatrice this summer, killing almost 300 people. The strongest earthquake there was 6.2-magnitude on August 24. Seismologists now fear a multiplier effect from the increased disruption resulting from the twin natural disasters. “The earthquake today has further disrupted the tectonic plates, and in the coming hours we may see aftershocks of today’s earthquake on top of those from August 24,” Salvatore Mazza, the National Institute of Geophysics and Volcanology told RAI News24. "This earthquake is likely the activation of a new fault line, connected to August's calamity. But we need to get closer to the epicenter, before drawing conclusions," said Paulo Messina, for the Institute of Environmental Geology and Geoengineering of the Italian National Research Council.